Spindle moulders are heavy duty machines that are used for the trimming and shaping of wood. They have been in use from the late 1800s. The devices, unfortunately, have a negative reputation regarding user safety, even though most of the dangerous spindle options were phased out in the early 2000s. However, if you talk about their modern version, they are quite safe and efficient. Consisting a revolving spindle, which can turn at various speeds based on the work in question, modern spindle moulders are utterly versatile, and therefore their demand is increasing with each passing day. To increase accuracy and to minimise setup times, modern spindle moulders make use of Axis control. Although it’s true that they are a bit expensive; however, when you consider the fact that they save enormous labour time, you wouldn’t mind spending your hard earned money in buying them. They will give you the full return on investment for sure. However, even though they are safe, you should still learn to use them correctly to eliminate the risk of injuries solely. Spindle moulders are generally used for printing profiles on wood. You might also use one for trimming or shaping your woodwork. Some models of this machine can be used during the tenoning process to create joints. 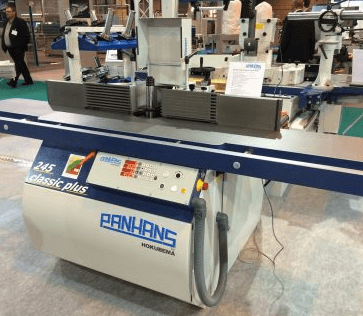 Once you are aware of what you want to do, you can learn to adjust the machine for an accurate cut.In other words, once you figure out what you want to use it for, you will be able to adjust it accordingly, which will give you the desired cut. Declutter the area around the machine by removing any debris or unnecessary materials. Check the exhaust system or dust collector to ensure it is in the right position. If your machine does not have a dust collector, install one. Inhaling dust can be harmful to your respiratory system. Besides, it is also essential to ask other people in your team to vacate the area if they are not part of the project in question because that makes your job site congested which can lead to accidents. One advantage of a spindle moulder is its ability to work with several bits of different sizes and shapes. Choose the blade that will be appropriate for the intended profile. If you are using it for the first time, ask for help from an experienced artisan or hobbyist. When you use a sharp blade, and you fail to take the necessary safety measures, you can end up with injuries. Therefore, during the first few times of the use, it’s better to ask an expert to guide you. And once you are aware of the technicalities of using them, you can carry out your work alone. Spindle moulders are notorious for turning the woodwork into a projectile. It becomes extremely dangerous if the revolving cutter comes off while rotating at high speed. Fake fences come in handy to prevent accidents from occurring. Most machines do not come with artificial fences but have a provision for them. You should make fences that match the blade you will be using as one size doesn’t fit all. Small blades require a narrow fence and vice versa. Adjust your fence to be as close as possible to the cutter. In most cases, fences are aligned parallel to each other to allow for straight cuts. However, you can also adjust it for angled cuts. Once you are ready to trim your wood, power the machine and the exhaust system. Apply pressure to the piece of wood downwards and towards the fence. Push it with equal pressure towards the cutter blade. To achieve the desired cut, you should be able to apply the pressure accordingly. A spindle moulder is considered one of the most dangerous pieces of woodworking equipment. Therefore, it is essential that you put on all your protective gear before starting the job. Common PPE supplies when using the machine are ear protectors, safety goggles, and a safety mask. For example, inhaling the dust that generates from your woodworking project can lead to lung cancer and breathing problems like occupational asthma. Besides, if the wood dust enters your body, it can have a severe impact on your intestines. Similarly, wood dust can also affect your eyes. Therefore, it’s highly essential for people using this machine to use masks and safety goggles. Similarly, if you fail to wear ear protectors while using it, you will end up confronting hearing problems. Although the number and severity of injuries from using this machine have reduced significantly over the years, accidents still happen. Here are some of the essential safety measures you need to take when using spindle moulders. Competence: Most injuries result from incompetence. All persons using or cleaning the machine should have adequate training. Experienced operators should be available to monitor new users.If you are not confident about using them, don’t make an effort to use them alone until you are fully aware of their use. Keep taking help from your seniors because that’s the only way to proceed further in a safe way. Braking: The law requires the maximum breaking time of the machine to be 10 seconds. Most modern machines meet this requirement. If you are using an older machine, install a braking device. Fences and shaw guards: These are necessary for protecting both the user and the woodwork. Most injuries result from not using or using the wrong type of guards. Assess each job to determine the right fence and pads to use It will not only keep you safe but will also enhance your productivity by improving your confidence. Avoid back cutting: Never feed the work space in the same direction as the cutter’s rotation as you will not be able to withstand the sudden forward movement. Always feed it in the opposite direction, even when a work holder or jig is used. We hope you enjoyed our concise guide on using the spindle moulders. Feel free to drop your questions or doubts in the comments section below. We would love to hear from you!